Simple & Sincere: Living life...at the beach. I decided to tackle two challenges with this card. The layout comes from Karen Giron's Sweet Sunday Sketch #19 and the color combo is this week's color challenge on Splitcoast: Bashful Blue, So Saffron and Pumpkin Pie. This is such a fun color combination for "summery" cards. I am so glad that I have some of my Washington Apple dsp left, because it fits perfectly with the color challenge. I also wanted to do something with those super cute flip-flops (I can never bring myself to call them thongs - hee hee) from Holiday Blitz, and I thought they would fit well with this week's Sweet Sunday Sketch. All in all, a pretty quick card to put together! OK, so tomorrow is the LAST blog candy giveaway! Can you believe it? I'll be posting a project and a picture of the goodies that will be going home to one lucky winner. Be sure to stop by tomorrow and leave me a comment for a chance to win! 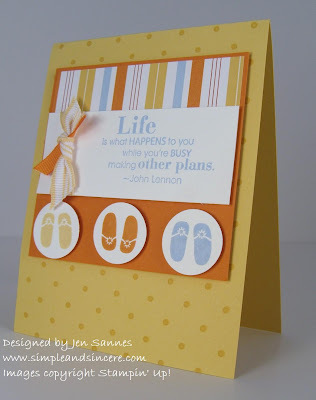 Very cute---haven't done this layout yet, but it's on my to-do list! Love Holiday Blitz! LOVE this! Great colors - great design! Great take on the challenges Jenn! I love the color combo and the sentiment is oh so true!! Super sweet and summery! I love it! Seeing this card makes me want to go to the beach! And that's exactly what I will be doing next week! Love your card!